Our country has some of the world's most unique legislators and rule-makers. One such rule of lower excise being applicable on sub-4m vehicles led to the birth of a unique segment of cars, the sub-4m sedan or compact sedan. Initially, when this rule was introduced, some innovative manufacturers started sticking a boot on few of their hatchbacks. This compact sedan segment saw unforeseen growth and the sub-4m Maruti Suzuki Swift Dzire even became one of India's highest selling vehicles, and it also remains the highest selling sedan in our country. That's something, isn't' it? The highest selling sedan is not a big one, but the compact Maruti Suzuki Dzire. While growth in this compact sedan segment is not as rapid as before, it continues to have very significant sale numbers. And no longer are manufacturers just slapping a boot on a hatchback. In fact, the sub-4m sedan is now designed alongside the hatch - case in point being the Tata Tigor which was launched a few months back. It is based on the Tata Tiago but has its very own distinct design language and styling. 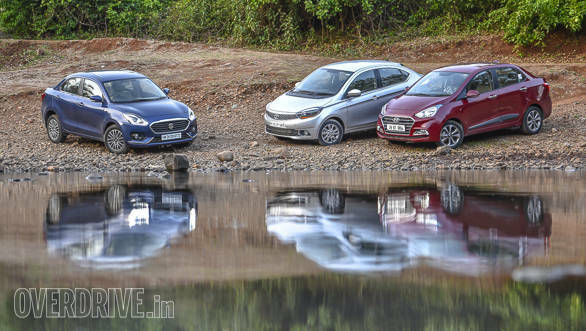 So far this year, we have also witnessed the launch of the facelifted Hyundai Xcent and the all-new Maruti Suzuki Dzire. Please note, Maruti has dropped Swift from the name and made the Dzire a standalone brand. 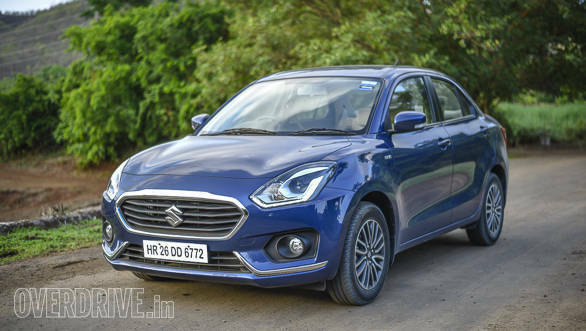 Let's see how the new Dzire weighs up against its newly introduced competition. The Tata Tigor easily wins the beauty contest. While the front resembles the Tiago, the B-pillar onwards it's all different. It has a smart rising beltline and a well-designed sloping roof that gives the Tigor a coupe-like character. 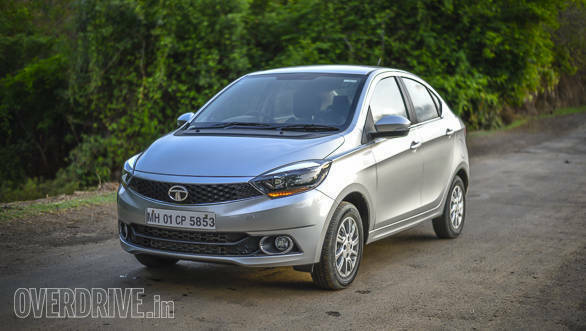 The lines are clean and the proportions are well balanced because Tata has managed to stretch the wheelbase and make it 50mm longer than the Tiago. The well-shaped tail lights are visually connected by a prominent chrome strip, and lower in the bumper are two small lights with the one on left incorporating the single reverse light. This does look a bit odd, and the illumination provided by the sole reverse light is not impressive either. But it has to be said - of all the compact sedans so far - the Tigor is the nicest-looking one. 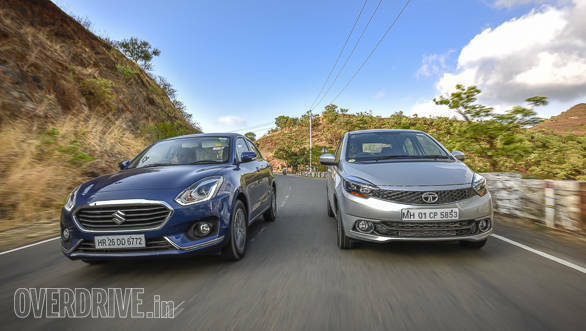 What's nice is that Hyundai's facelifted Xcent also looks better, and the Dzire has significantly enhanced styling too. The new Hyundai Xcent's facelift job is clearly inspired by its bigger cousins like the Verna and Elantra. The Xcent surely looks more premium and now has a very large cascading family face grille, extending almost to the bottom of the bumper. This big grille completely dominates the front-end design, and the daytime running LED lights that are placed around the fog lights also look really neat and elegant. Hyundai has done significant work on the rear too, and the Xcent has new large tail lights and a dual-tone rear bumper with sleek reflectors. Overall, it's much nicer-looking than the earlier Xcent. The Maruti Suzuki Dzire's visit to the sculpting shop has also been a success. The fresh styling makes it look more like a sedan and not like a hatch with a boot pasted on. One glance is enough to tell you that the Dzire has evolved and looks far better than its earlier versions. The overall design is curvier and the rounded bonnet combines well with the big new grille with prominent chrome garnishing. In fact, there are chrome trims even below the fog lights. The smartly shaped headlights incorporate LED daytime running lights, and the more rounded rear also has neat new tail lights with tidy circular LED detailing integrated within the brake lights. A chunky strip of chrome is placed between the tail lights, and two reflectors have been discreetly placed at the bottom of the bumper. 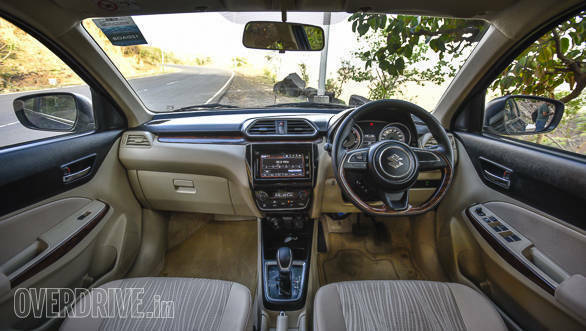 Step inside and the new Maruti Dzire's passenger compartment easily looks and feels the best. The beige and black colour combination works well, and one thing I particularly like are the somewhat raised AC vents at the corners of the dash. It's a nice styling touch, and the faux wood trim across the dash, steering bottom and door panels also has good gloss and does not look at all cheap. But the flat-bottom steering wheel is a bit of overkill. Yes, it's thick and feels good to hold, but one normally associates flat-bottom wheels with more sporty cars, so in the Dzire it does feel a bit out of place. The top-end versions get a large touchscreen display with GPS navigation, Android Auto and Apple CarPlay. The instruments are simple but very easy to read and the ergonomics are faultless too. Maruti has also worked on increasing the space, and now the Dzire has the most comfortable rear seat of the three. It offers better under-thigh support and more legroom, and the headroom is also very good. As the Dzire is the widest car of the three, the rear seat can also accommodate a third person in fair comfort. Even the driver and front passenger have more space than in the other two, and there are lots of practical storage spaces to keep your knick-knacks. The Maruti Dzire is the only one in which all four headrests are removable and adjustable. In the Hyundai Xcent, the rear headrests are adjustable and removable while in the Tigor it's quite opposite with the front ones being adjustable and removable while the rear ones are fixed. These fixed headrests in the Tigor jut out quite a bit and push the heads of the passengers forward. But the seatback is quite sloped which results in an odd and not too comfortable seating position. 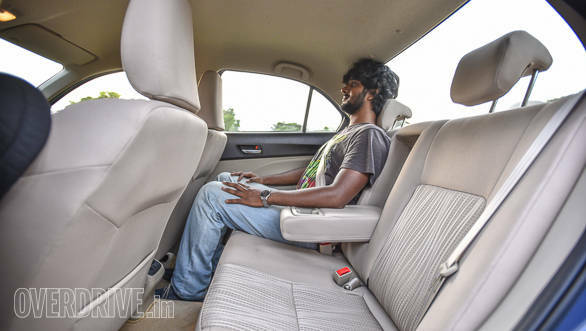 In fact, the rear seat of the Tata Tigor is the least comfortable of this lot. It does not offer adequate under-thigh support, the headroom is also restricted due to the sloping roof and the legroom is also much less than what is available in the other two cars. And the Tigor's rear seat is only wide enough to accommodate two. 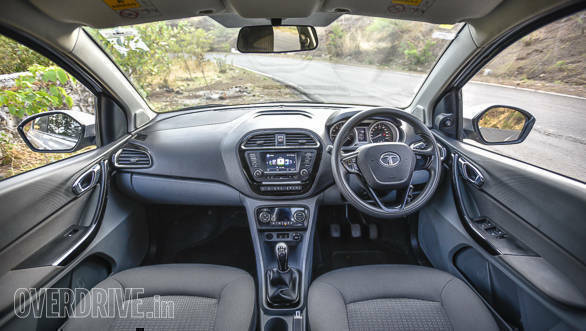 While the Dzire and Xcent have rear AC vents, the Tata Tigor does not. 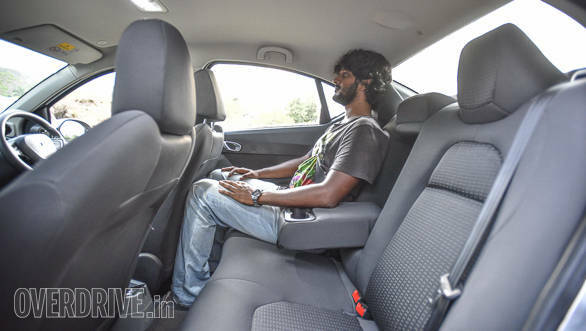 The Tigor also has very limited space to store stuff, and the only place to keep a 1-litre bottle of water is in a cupholder placed between the front two seats. As is typical of most Tatas, the driving position in the Tigor is too upright. Yes, it does have a height-adjustable seat, but even at the lowest setting you feel you are sitting way too high. Thanks to the intruding console and armrest on the door, any decently built person will feel a bit cramped in the driver's seat. The Tigor's steering also blocks a bit of the view of the instruments. But it must be said that the quality of materials in the Tigor is a big improvement on what we have been seeing from Tata. 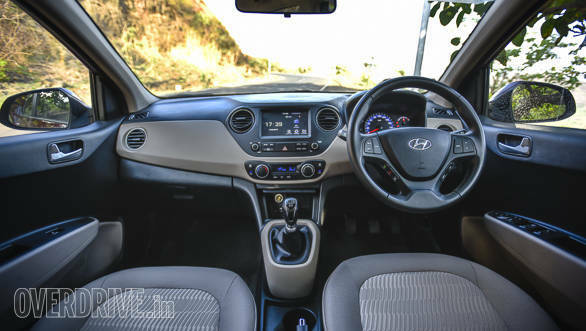 The quality of materials used in the passenger compartment of the Hyundai Xcent is quite impressive, and it has all the updates of the facelifted Grand i10. This means it has the new touchscreen infotainment unit that is simple and easy to use. The steering wheel is also new and has a new voice command button that works only if your compatible phone is connected via a USB. The Xcent continues to offer features like automatic climate control, cooled glove box and ample storage spaces. At 407 litres, it also offers good boot space, but not as much as the Tata Tigor (419 litres). Maruti has increased the Dzire's boot space by 60 litres and it's now 380 litres. Though the Hyundai Xcent is the smallest car in this contest, it offers a fair amount of space. The rear seat has good legroom and headroom, and two can sit quite comfortable at the back. While the driving position in the Xcent is good, the diver does not have as much space as in the Dzire. And after spending some long hours in them, the Xcent's front seats don't feel as comfortable as those of the Dzire. The Maruti Dzire is the only one here that is powered by a 1.3-litre, 4-cylinder diesel engine. 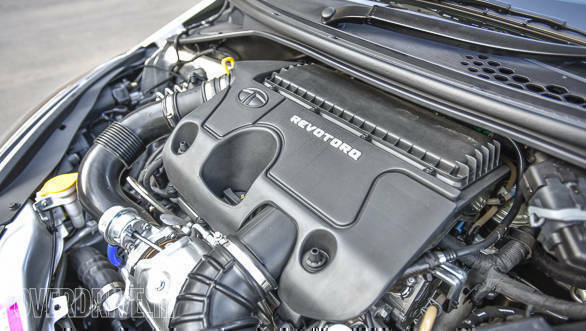 Under the bonnet of the Xcent resides a 1.2-litre, 3-cylinder diesel engine and the Tata Tigor has a 1.1-litre, 3-cylinder diesel. 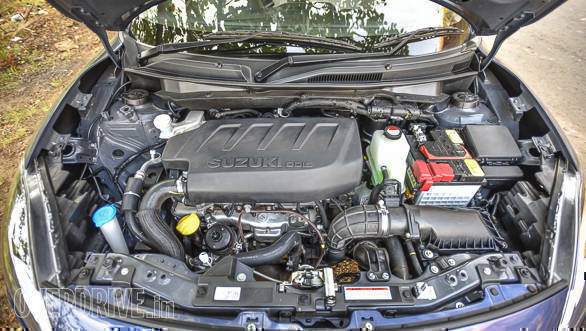 The Dzire's engine generates 75PS and 190Nm of torque, and the Xcent also has identical power and torque outputs. 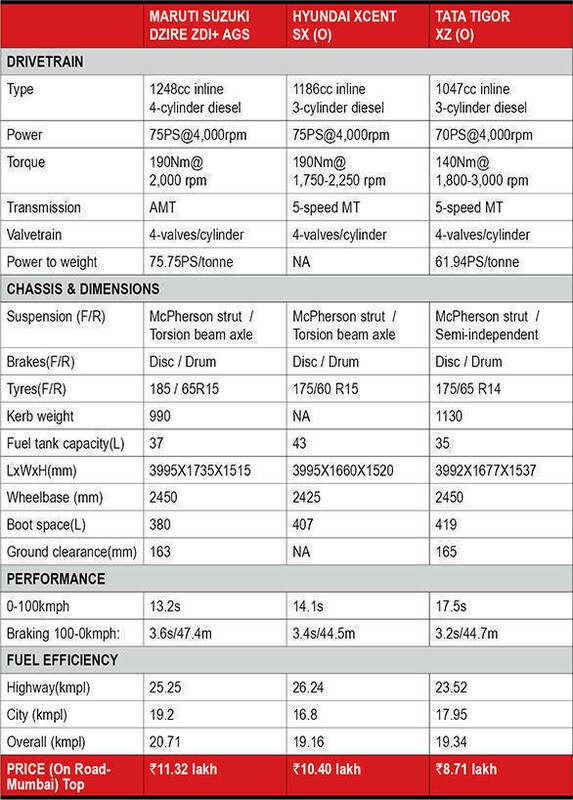 The Tata Tigor, which is the heaviest vehicle here at 1,130kg, also generates the least amount of power (70PS) and torque (140Nm). And this shows in the on-road performance. As the new Maruti Dzire is based on the same Heartech platform also shared by the Baleno and Ignis, it has shed weight, and at 990kg it's a full 105kg lighter than the earlier Dzire. Put the show on the road and you instantly feel that the Dzire's familiar and proven 1.3-litre engine is the most peppy and responsive of the lot. The Dzire gets off the mark smartly and reaches 100kmph in 13.2 seconds, while the Xcent takes 14.1 seconds and the Tigor 17.5 seconds. The in-gear acceleration or drivability of the Tigor is also the worst, while both the Dzire and Xcent offer fairly good drivability. 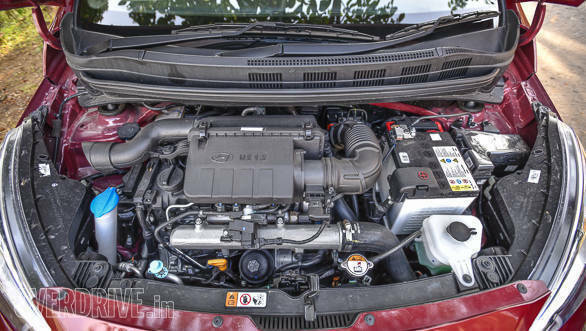 The Dzire's engine is the most refined and the Xcent's engine is also impressively smooth and silent. Of course, higher in the rev range they do get vocal but never to a point of getting bothersome. The Tigor is just not in the same class. The engine is loud, unrefined and really underpowered compared to the others, and driving it is no fun at all. 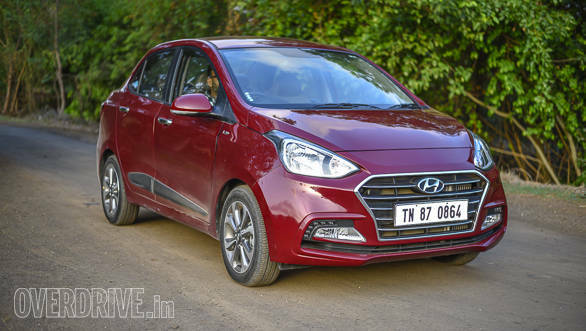 All three come with 5-speed manual transmissions and while the Maruti Dzire is also available with AGS (Automatic Gear Shift), Hyundai offers a 4-speed automatic on the petrol Xcent. The gearshift quality on both the Dzire and Xcent is very good, and the Tata Tigor's is not bad either. In fact, the Tigor's gear shift quality is the best I have ever experienced in a Tata vehicle. What it lacks is only a bit more of feel. While we drove both the manual and AGS Dzire, I was most impressed with how much Maruti engineers have improved the AGS, especially how it downshifts. If you are doing 50kmph in fourth gear and you floor the accelerator, the AGS immediately shifts down to second and provides the urgent acceleration you desire. Yes, the Dzire's AGS can actually skip a gear when required. Really very impressive. Interestingly, Maruti gives ABS as standard on all variants of the new Dzire, while both Hyundai and Tata offer it on higher trim versions of the Xcent and Tigor. 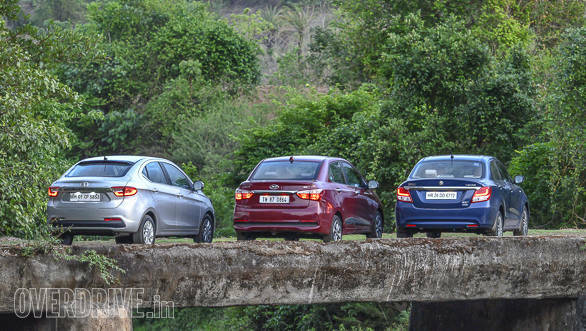 The braking of the Xcent is the best, and in our test it took 44.5 metres to come to a halt from 100kmph, while the Tigor needed 44.7 metres and the Dzire 47.4. Hit a bump or go over broken and rough patches of road, and you immediately realise that the Maruti engineers and the Heartech platform have given the new Dzire extremely impressive ride quality. It easily suppresses all deformities in the road and insulates the occupants from most of the bumps, potholes, dips etc. 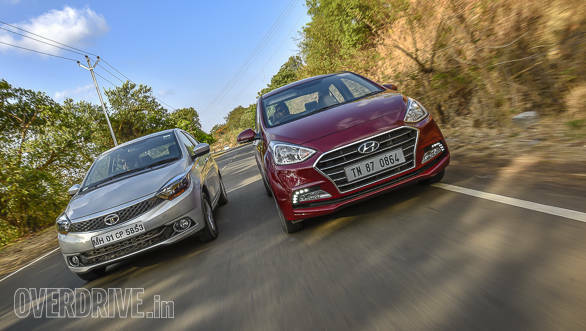 It actually rides like a much bigger vehicle and while the Hyundai Xcent also rides well, its suspension speaks a bit more and tells you more about what is happening under the wheels and tyres. The Tigor has a Tata-type typical ride that deals with bumps quite well, but the suspension does thud and at high speeds the Tigor feels bouncy. It also has excessive body roll. The Dzire feels quite planted and changes direction well. The steering is precise but could do with more feedback. But at higher speeds there is a fair amount of wind noise, which could be because of the door mirrors that jut out a fair bit. The Hyundai Xcent too has decent driving dynamics and goes around corners fairly well. The Tigor does not feel as stable as the others at speed because of the body roll and its tendency to bounce on bumps. Its steering is also not as quick as the others and lacks feel too. If you feel the need to blow the horn, you will find that the Dzire has the best-sounding one and the Xcent the worst. The LED headlights of the Dzire don't provide great illumination, and it's the Xcent's headlamps that do the best job of lighting the way ahead. In our tests, the Maruti Dzire delivered the best overall fuel efficiency. The Xcent was next best with the Tigor almost matching it. The Dzire is the most expensive of the three with the gap between its top-end manual version and that of the Xcent being Rs 35,000. The Tata Tigor is much cheaper, and its top-end one costs over Rs 2,00,000 less than the Dzire. The new Maruti Dzire is the winner of this contest followed by the Hyundai Xcent and the Tata Tigor. The Tigor is the best looking of the three, but unfortunately it's let down by its performance, interior space etc. Although it offers the best value, I don't think it can really challenge either the Dzire or the Xcent. 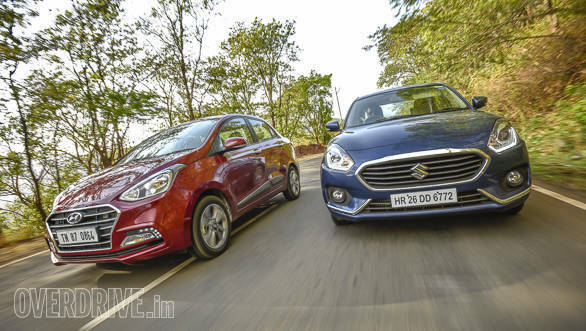 The fight in the end is between the new Dzire and Xcent, and it's a really close battle because the Xcent does almost everything as well as the Dzire and at a lower price. But I would still opt for the Dzire. Simply because of its passenger compartment, ride quality and NVH levels. The passenger compartment is not only more spacious and comfortable than that of the Xcent, but also smarter looking. As mentioned, the ride quality is superior and rivals that of the bigger cars. And the proven 1.3-litre diesel of the Dzire remains one of the most responsive and refined ones around. Looks like Maruti has once again come up with a winner.